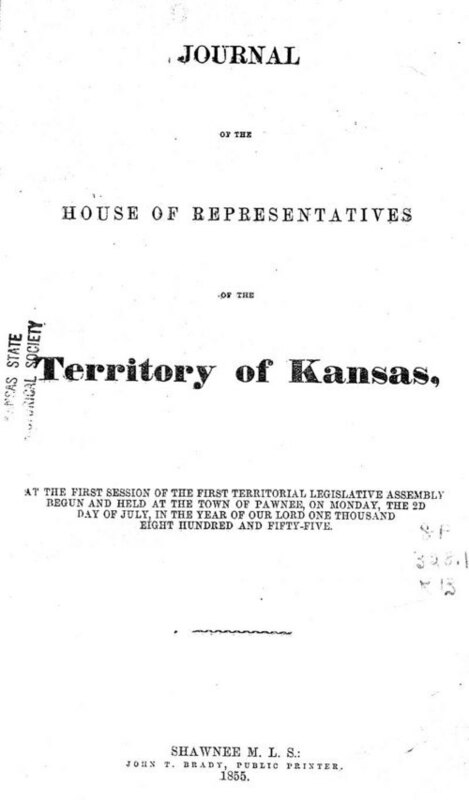 This printed document reported upon the actions of the First Territorial House of Representatives when it first met at the town of Pawnee near Fort Riley on Monday, July 2, 1855. On July 6, 1855, the House of Representatives approved a resolution sent to them by the Council (Senate) that moved the meeting of the Legislature to Shawnee Manual Labor School beginning July 16, 1855. This first session of the House of Representatives concluded on August 30, 1855. Included in the volume were various messages from the Governor and Acting Governor. The appendix contained reports of various committees--judiciary, a special committee on exempting slaves from execution, bounds of counties and districts, elections, convention, and public printing. The appendix also included the "opinion of the Supreme Court in regard to the legality of the present session" by Samuel Lecompte and Rush Elmore, a memorial from the legislature of Kansas to the President of the United States requesting the removal of Andrew Reeder, and the Rules and Orders under which the House of Representatives conducted business. The last 31 pages are an index to the volume.